Aspen Pet® containment products give dogs the freedom they crave while keeping them safe and out of trouble in the absence of a fence. Aspen Pet Containment Stakes are durable and easy to install in all types of soil. They come in a variety of sizes and styles for maximum anchoring and control. The Aspen Pet Spiral Stake is just the thing to give your dog freedom of movement while keeping him safely contained to a specific area. Quick and easy-to-install stake screws into the ground and stays firmly anchored with dual wedge plate anchors that prevent pullout. Domed styling eliminates problems caused by handles protruding from the ground. Super strong solid steel shaft. Double welded. Features 360-degree swivel ring to attach tie-out cable. Malleable swivel gives pets 360 degrees of roaming and no tangle freedom. 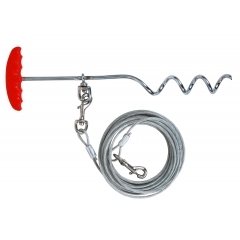 Medium is a 16-inch spiral stake for medium sized dogs up to 50 lbs. The large is an 18-inch stake for large dogs up to 100 lbs.